I don’t know about you, but the older I get, the more exhausted I become when the holidays roll around. It’s a lot of work…cooking, cleaning, baking, making sure there are Martha moments everywhere, keeping everyone happy. But we have one more celebration and then it’s back to normal day to day living (there is something calming to be said about routine, right?). But, if you are having a New Years gathering, the last thing it should be – especially for the host – is stressful. Christmas, Hanukkah, and all the other holidays always create a feeling of nostalgia and, that usually means making dishes that are unfamiliar but expected. If you are trying to re-create dishes that may not be in your normal repertoire, of course you are going to be stressed. But New Years Eve, at least to me, is about trying new things if you like, but also, creating a serve-yourself kind of party so the host can also enjoy the celebrations. First things first, NYE is usually all about the bubbly. But don’t forget your friends that aren’t drinking – all those DD or pregnant mamas! Always have a variety of non-alcoholic drinks to offer (there’s lots of non-alcoholic champagne out there) and make sure your non-drinking friends feel like they are still part of the party…like the cute milk and cookie shots in the opening pic! 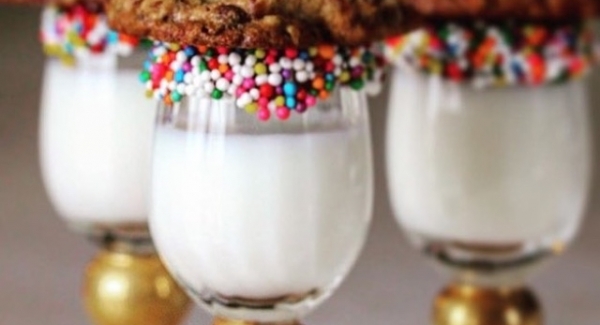 So cute…especially for the kidlets (just dip shooter glasses in melted chocolate or Nutella, dip in sprinkles, add milk and top with a warm, out-of-the-oven cookie!!). And, if you struggle with dessert, always make sure you have some good quality ice cream in the freezer…add some store bought pound cake and some chocolate sauce, and you’ll be a holiday hero for sure!! These phyllo cups are always a hit at my parties!! The are so easy to make and pretty much serve themselves!! Check out this blog post on how to make them and this blog post on different ways to serve them!! I also find that NYE celebrations call for bite sized treats like some cake pops or truffles instead of a full cake, or these cute cinnamon roll stick treats (just crescent rolls filled with nutella and sliced thin…then placed on a stick!). Also, those milk shot glasses from above can be filled with simple things like pudding or custard! These NYE sweet bread dippers are just Pillsbury crescent rolls cut into strips, formed into numbers, sprinkled with cinnamon sugar and then baked until crisp. Serve it with strawberry sauce and cookie butter!! These mason jars are the best make ahead individual eats you can serve at a party!! Just fill small mason jars with chili and then top with cornbread batter (you can use store bought or try this amazing recipe), then bake in the oven until the batter is cooked…so tummy warming on a cold winter night!! Sometimes it’s amazing just to have a good sweet recipe in your repertoire that comes together quickly and feeds an army!! Why not try these brownies that freeze well and can either be served on their own or as part of a sweet dessert board! And, finally, if you have a bit of time, I always like to give my guests a treat to leave with. Since most people will be on the healthy bandwagon the very next day, why not send them away with some healthy treats like homemade granola bars or small bags of granola)?? I hope that some of these ideas will help you ring in the new year a little less stressed. Shoot me a message and let me know! !